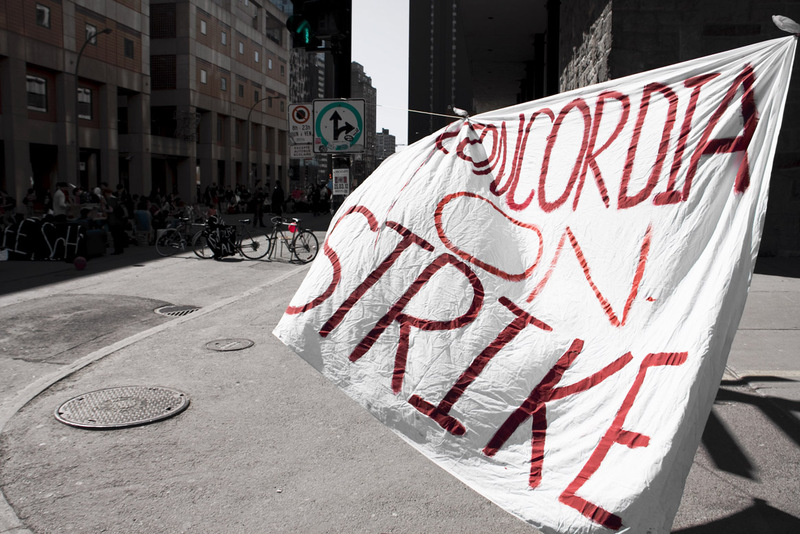 This afternoon, an enthusiastic group of BA, MA and PhD students from Concordia University’s Department of Communications Studies held a picket line at the southeast door of the CJ Building at the Loyola campus. Many of the department’s faculty lent their support to the action. The purpose of the picket line was to maintain a strike presence on the Loyola Campus, to create placards and banners for the mass tomorrow’s mass demonstration, to feed our camaraderie and strengthen our solidarity. It was also a space to meet with passersby from different departments and other faculties by offering them red felt squares, information flyers and an affable opportunity for conversation. Strikes do not only foment divisions, they also provide opportunities for dialogue where dialogue would not otherwise present itself. 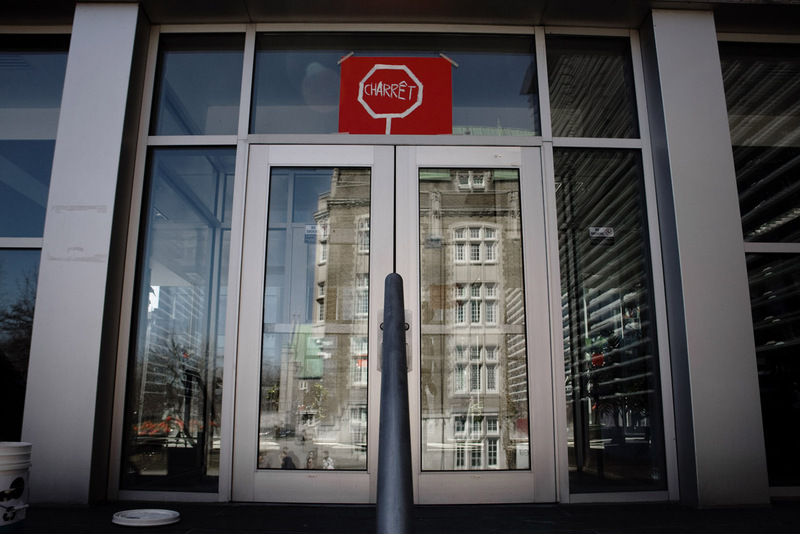 The southeast entrance to Loyola's CJ Building and the "Charrêt" stop sign that reminds students of the strike. 2012 © Eduardo Fuenmayor. “Would you like a red square?” received mixed responses. Some students and professors responded sharply to my proposal with a “No thanks!” Others wouldn’t look me in the eye maybe from fear of a confrontation. One student turned to me as she rushed past my outstretched offering of red felt and a safety pin, and snapped, “I have the right to my education too! !” Maybe she blamed me for missing a class tomorrow after the university administration’s decision to lock down both campuses for the entire day of the mass demonstration. Dialogue did not come easy with everyone. These are representations of the divisiveness that strikes are known for. 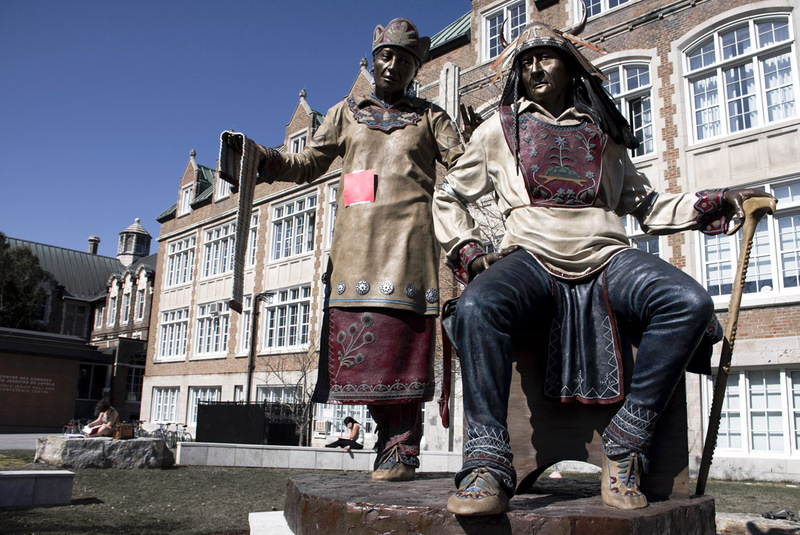 One figure in "The Emergence of the Chief" sculpture by David McGary donned the symbol of student solidarity for maintaining accessible education. 2012 © Eduardo Fuenmayor. One student seemed unaware of the strike, whose intensity had not really reached the Loyola Campus. How is this possible I thought to myself, wondering if it was plausible that a student from UQAM or Université de Montréal could be unaware of the student strike. I doubt it. The difference in media coverage of the student strike between anglophone and francophone media has manifest differences, which could explain the cluelessness. The southeast entrance to Loyola's CJ Building and its festive picket. 2012 © Eduardo Fuenmayor. Two students from Exercise Science responded to my offer with a “yes, why not”, to which I replied do you know what this red square is a symbol of?” They didn’t. 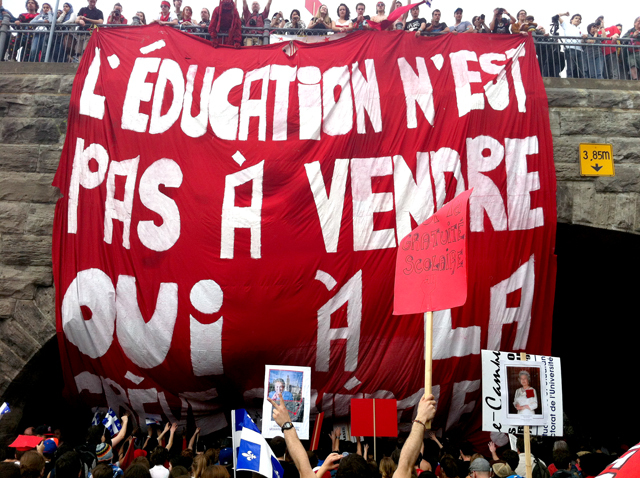 I explained that in 2005, when the Québec government decided to take $103 million from the student bursary purse and transfer it to loans, students were incensed! Actually they were mad as hell because without bursaries, they would end up “squarely in the red” (a translation of carrément dans le rouge). Indebted to the hilt. Red square… debt… get it?! These two guys were interested in the history of the Québec student movement that has fought periodically for decades to maintain low tuition in support of accessible education. I continued. 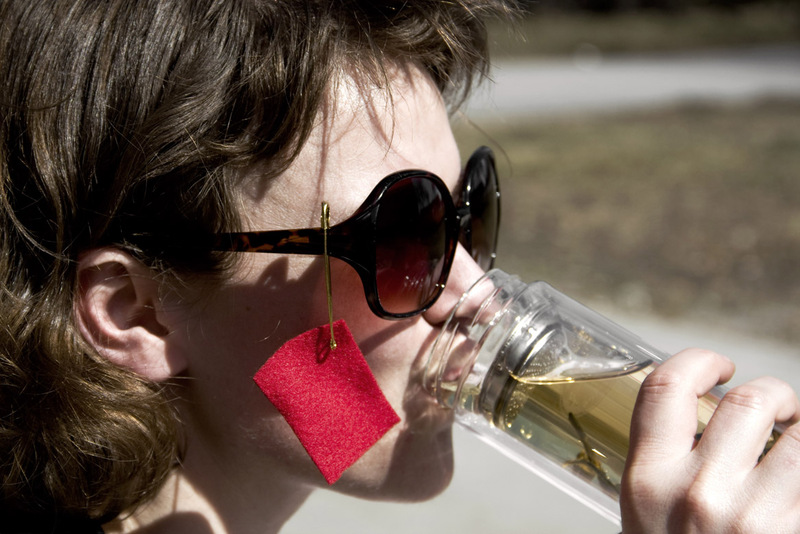 One student on the picket line drinks tea in the unseasonably hot 25 degrees Celcius. 2012 © Eduardo Fuenmayor. 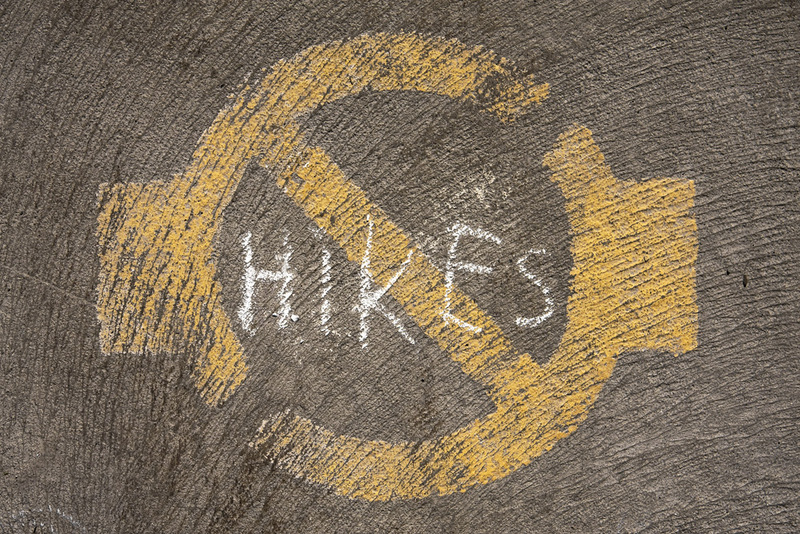 The most common argument in support of tuition increases is that Québec tuition rates are the lowest in Canada. That’s exactly the point because Québec society made that decision decades ago to keep education accessible. The Charest government drones on about students paying their fair share. Québecois pay among the highest income and sales tax in North America because we want accessible education as a collective social project. Before stating that universities are underfunded because of the low tuition fees, critics should look at where the current government is allocating public funds. Consider one example from yesterday’s provincial budget: a $332 million grant in public funds is made available to extend route 167 so that the mining corporation, Stornoway Diamonds, can access its future mine. Stornoway is only paying a franctional $44 million for the construction of a permanent road that leads nowhere else than its future mine. Why are Québécois residents subsidizing this corporation to extract a non-essential mineral from public land?! Would this money not be better spent on education or healthcare or anywhere else with longterm benefits for Québec citizens? This is our picket line, soft as chalk on pavement. Cross it and have a conversation. 2012 © Eduardo Fuenmayor. No to tuition hikes! 2012 © Eduardo Fuenmayor. I realized that that is what I’d been doing all afternoon. Map of Artung! 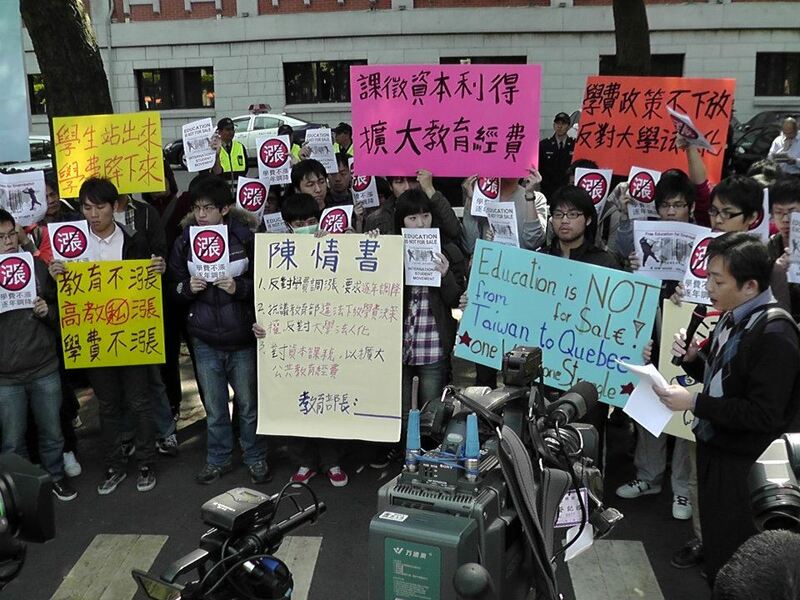 's reclamation of public space in support of access to education. “The public space should encourage citizen expression and represent different points of view. Unfortunately, the urban landscape is overrun with advertisements. The commercialization of our living space leaves room for only one message: sell and consume”, according to the co-spokesperson of ARTUNG!, Peggy Faye. An Artung! intervention with artwork by the Beehive Design Collective. 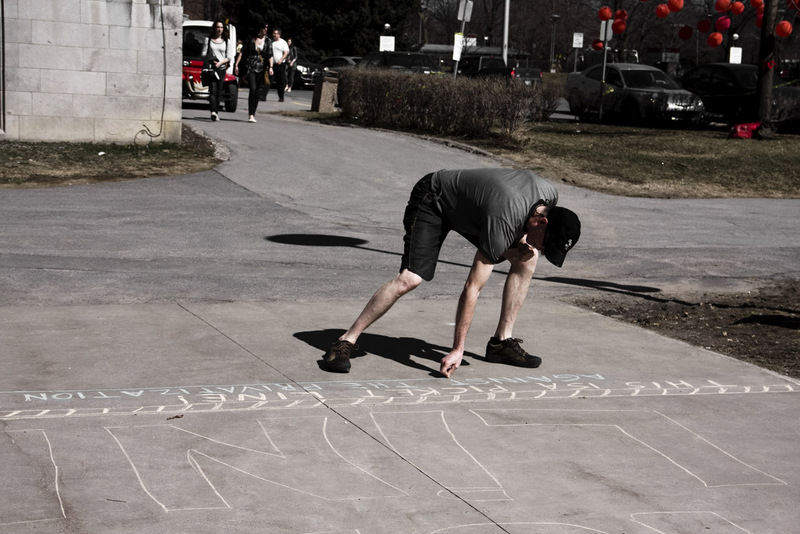 Last May, 200 advertisements were replaced by artworks to reclaim the public space while at the same time denouncing the lawsuit filed by Pattison, CBS Outdoor and Astral Media against the Plateau-Mont-Royal borough. On September 7, 2010, Mayor Ferrandez’s administration adopted a by law calling for the removal of the 45 panels installed on its territory. 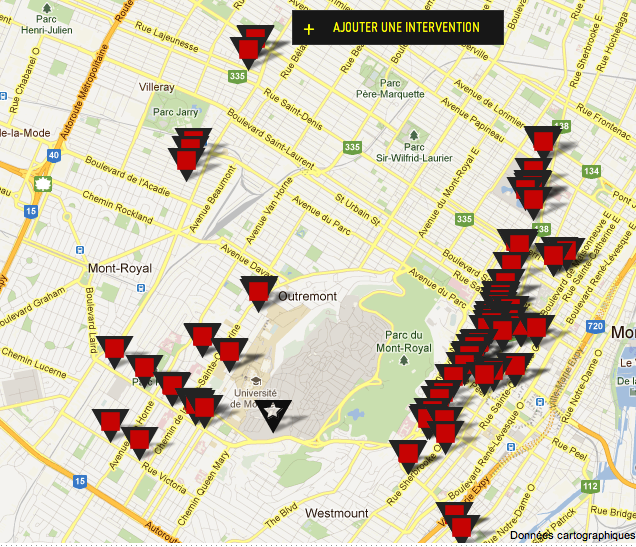 Today, although the Plateau-Mont-Royal borough has sent out 86 statements of offense, none of the huge advertising panels has been removed – these companies are therefore acting illegally. This time, the ARTUNG initiative is coming out in support of the 220 900 students who are presently on strike. Tomorrow the 22 of March, thousands of citizens will fill the public space during a huge national demonstration to oppose the decision of the liberal government to increase tuition fees. This measure impairs the accessibility of education and public services. 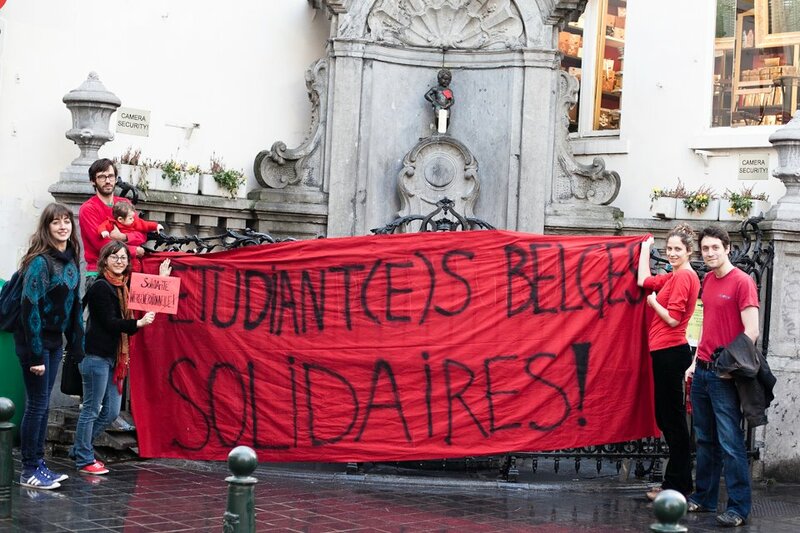 “Teaching institutions, like the streets, should be places of dialogue rather than spaces subjected to the economics of the market,” states Pascale Brunet, co-spokesperson of ARTUNG! Made up of a constellation of citizens of all stripes, ARTUNG! Invites the population to participate in a reflection on the future of our public spaces. Our streets should be a canvas for all communities and not for private companies. Our schools should be places for meeting and debating ideas, and not degree factories. Ce matin, ARTUNG ! offre plus de 300 oeuvres d’art aux citoyen.ne.s de Montréal. Installées dans des supports publicitaires appartenant à Pattison, CBS Outdoor et Astral Media, ces affiches dénoncent la hausse des frais de scolarité. « L’espace public devrait encourager l’expression citoyenne et représenter différents points de vue. Malheureusement, le paysage urbain est envahi par les publicités. La commercialisation de notre milieu de vie ne laisse place qu’à un seul message : vendre et consommer » soutient la co-porte-parole d’ARTUNG!, Peggy Faye. Artung! 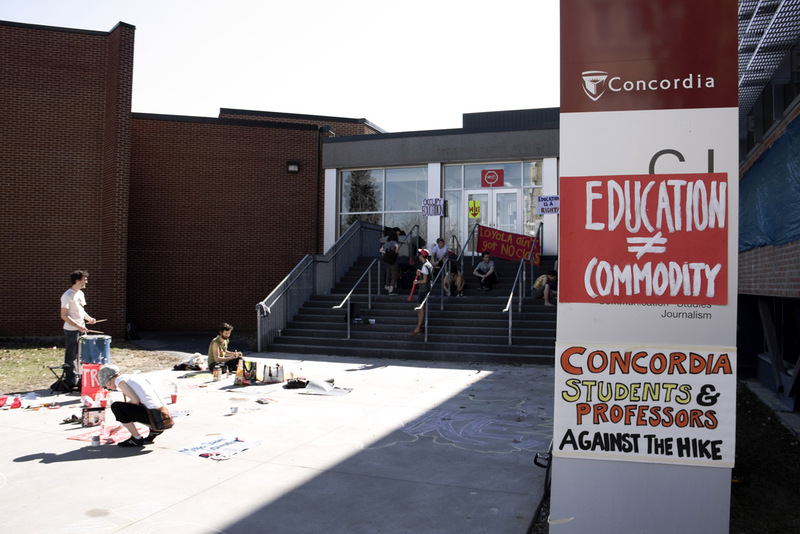 in support of the student strike against tuition increases. Rappelons qu’en mai dernier, 200 publicités avaient été remplacées par des oeuvres d’art pour réinvestir l’espace public et condamner la poursuite de Pattison, CBS Outdoor et Astral Media contre l’arrondissement du Plateau-Mont-Royal. En septembre 2010, un règlement imposait le retrait des 45 panneaux publicitaires installés sur le Plateau. Aujourd’hui, bien que 86 constats d’infraction aient été émis par l’arrondissement, aucun de ces immenses panneaux publicitaires n’a été retiré. Ces compagnies ont donc des pratiques illégales. 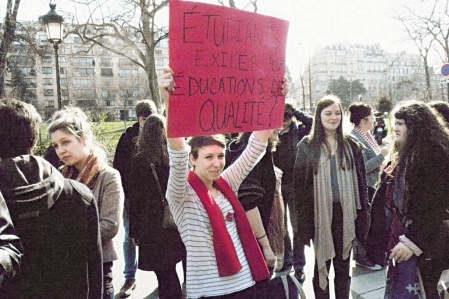 Cette fois-ci, l’initiative d’ARTUNG vient en appui aux 220 900 étudiant.e s qui sont présentement en grève. Demain le 22 mars, des milliers de citoyen.ne.s investiront l’espace public lors d’une gigantesque manifestation nationale pour s’opposer à la décision du gouvernement libéral de hausser les frais de scolarité. Cette mesure nuit à l’accessibilité aux études en plus de s’inscrire dans une logique de marchandisation de l’éducation et des services publics. « Les établissements d’enseignement, tout comme les rues, devraient être des lieux de dialogue plutôt que des espaces assujettis à l’économie de marché » a déclaré Pascale Brunet, co-porte-parole d’ARTUNG! Formé d’une constellation de citoyen.ne.s de tout acabit, ARTUNG! invite la population à participer à une réflexion sur l’avenir de nos espaces publics.